Use a hand mixer to beat the flour, baking soda, sugar and salt. Incorporate the egg, milk, shortening and melted butter. To make the waffles even better simply add ½ teaspoon of cinnamon powder. Set the mixture aside. Clean the chicken breasts and season to your liking. Place them on a hot griddle or grill with a bit of cooking spray for about 15 minutes. Be sure it's cooked well on both sides. In the meantime, remove the core from that apple and cut into thin slices. Then slice the Brie. Beat all the ingredients for the aioli cream in a deep bowl with a hand mixer. Don't move the mixture in circles, simply leave it right in the middle until the mixture begins to thicken and then move around until you achieve your desired consistency. Refrigerate for a while so it can cool for when you’re ready to serve. Heat the waffle iron and sprinkle with cooking spray then place 4 tablespoons of the mixture in the spaces for each waffle. Let cook for 4 minutes or until they lightly browned and toasted. 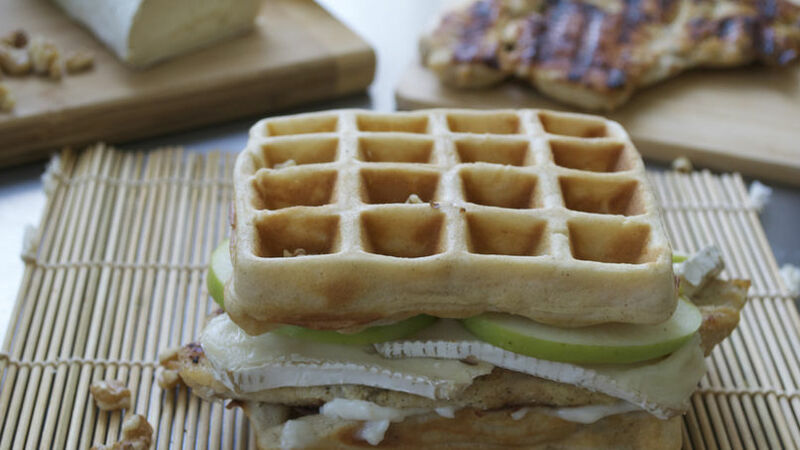 Begin to build your waffle sandwiches by spreading a bit of aioli cream on two waffles. Place a fillet of chicken on each, a few strips of brie and apples, sprinkle with nuts and then cover with the remaining waffles. Serve hot. If you're not going to build the sandwiches right away, I recommend cutting the slices of apple an placing them in a bit of water with lemon to prevent them from bruising. You can sprinkle the walnuts on the waffles and drizzle with honey. You can keep the extra aioli sauce refrigerated in sealed container. Don't be afraid to combine recipes and fuse cultures in your kitchen, dare to give original recipes a twist to achieve a new mouthwatering creation. Enjoy your family's favorite dishes in new ways so you never get tired of them and so you keep your family happy at the dinner table. The combination or fusion of different dishes and cultures in known as a Food Mashup. It's so much fun. I, for example, love homemade waffles, normally consumed with syrup, butter and fruit. I prepare them like gourmet sandwiches with grilled chicken fillets, aioli cream, a touch of brie and crunchy slices of green apple. To complete the meal I add a handful of walnuts. Get to work and enjoy!